I had a cat during all of my teenage years. Not once did I trim her nails nor have them trimmed. She only had one bath her whole life… a memorable event for sure. I never brushed her, not that she would have allowed it. She always looked and smelled clean. It’s sort of embarrassing to admit that I was so lax when it came to my cat’s grooming needs, but I don’t think I’m the only one. A lot of people don’t even think of grooming their cat. Cats are pretty self-sufficient. They keep clean by licking themselves with their sandpaper-like tongues. They keep their nails groomed on their scratching posts (or our couches! ), or wear them down outside on walkways, gravel or pavement. All that most people do to assure their cat’s good health is to have regular vet check-ups, provide flea and tick prevention, feed quality food, and keep current on vaccinations. I can proudly say that I did all of those things. I was lucky. My cat, Tiger (aka “Kitty”), was seemingly very healthy and kept herself nice and clean. But had I known what I know now about cat health, I would have made an effort to groom her. Not just for her well-being, but it would have been a good bonding regimen, as she never really seemed attached to me or anyone else in the family. If I had it to do over, I would have started grooming Tiger as a kitten. If you are fortunate enough to have a kitten, start now. If you have an adult cat, start slowly. It may be that your adult cat will never get to the point of “enjoying” grooming, but, as someone who wishes they had, I think it would be worth trying. Where to start… I think brushing is the easiest and most beneficial thing you can do for your cat. Cats look clean, but under all that beautiful coat you’ll likely find dead hair, dirt, and flakes. Brushing will get all that out and will encourage good circulation. Brushing helps distribute oils to keep her skin and coat invigorated. Ridding your cat of all that excess hair goes a long way in helping to prevent fur balls too. 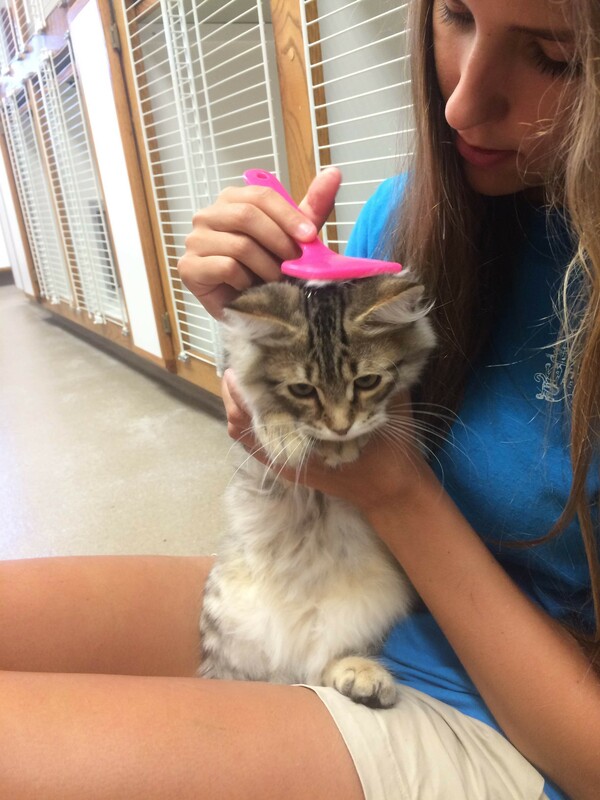 I prefer a metal comb when grooming a cat… use it gently, though. They can be pretty sharp. Do a little checkup while you’re at it… Regular brushing gives you the opportunity to see any fleas, sore spots, bumps, anything out of the ordinary that may need your vet’s attention. How I was able to have a healthy cat without having paid more attention to her skin and coat is just pure luck. My regular vet visits must have sustained her good health. Most of the time your cat’s own grooming (licking) is adequate to keep her clean. If she gets very dirty, or she gets into something really stinky, you may need to give her a bath. Cats generally have an aversion to water, even though many are “fascinated” by it. Some cats enjoy batting at a dripping or running faucet and cat owners often tell us of how their cat hangs by the shower or bathtub when they’re in it. In most cases, though, if you attempt to immerse your cat in water, you’ll have a “cat fight” on your hands. It’s a better idea to put your cat in the sink/tub first. Put a towel or rubber mat in the bottom of the tub to give her something to grip onto. Then maybe dip a washcloth in room temperature/slightly warm water and wipe it gently over her back. When she seems to be okay with being wet, turn the faucet on slowly, but don’t let the water get too deep…a couple inches will do. Soap her up gently with a shampoo designed specifically for cats. Work gently, talk softly. Be careful not to get soap in her eyes or ears. Rinse off the shampoo using a pitcher or cup. Afterwards, enjoy towel/cuddle time… that’s always nice. Some people think you should never trim your cat’s nails. They believe it is damaging to their confidence to trim their nails as it is part of their “identity”. I don’t know about that, however, I do know that if you have an outdoor cat, it’s best not to trim their nails as they need them for climbing and for defending themselves. Many, including veterinarians, believe it’s imperative to your cat’s health to trim their nails. I am merely confused at this point. However, I see no reason not to trim an indoor cat’s nails… if only to protect your furniture… and your skin should she decide to “knead bread” on you. Some veterinarians advise that we trim a cat’s nails to assist them in shedding the outer layer of their nail which they can sometimes have difficulty removing. You see, cat’s nails grow in layers. The outer layer is like a little shell. When they sharpen their claws – hopefully on their scratching post – they remove the outer shell. If they are unable to remove the outer shell, those little layers could grow into the skin, kind-of like an ingrown nail. It’s painful. When we manually trim their nails, we assist in that shell removal making them more comfortable. It’s actually pretty easy to trim a cat’s nails, as long as they are agreeable to it. If you press gently on the top and bottom of their paw just behind the claw, their nails will naturally extend. It’s kind-of cool… like they’re just sticking them out there for you! Trim only the very tips of the nails…. Don’t trim too deep or you’ll end up cutting the quick which is very painful to them. Cats ears are easy to clean. Start your ear cleaning with a little examination… Simply fold back her tiny ear and look into the canal. It should be a soft pink color, not red or irritated. There shouldn’t be any bad odor and should be mostly free of any debris. Put a few drops of kitty ear cleaner on a cotton ball and wipe away any dirt or wax, being careful not to push it back into the ear canal. If you discover any redness, foul odors, black or yellow discharge, or blood, take her to see the vet. I don’t think I have ever known anyone who brushes their cat’s teeth, but, just like dogs, it makes sense that you should. As a matter of fact, I researched the subject in hopes of finding a reason NOT to have to brush their teeth, but was unable to do so. Darn it. If you have an adult cat that has never had his teeth brushed, my guess it is that it will be next to impossible to get him accept you putting a strange object in his mouth. If you have a kitten, you’re in luck. Just like baths, get them used to it while they’re young. Give them a toothbrush to play with. They’ll probably like the way it feels to chew on the bristle part of the brush… then you’re at least past first base in the cleaning process. There are toothpaste and toothbrushes made specifically for your cat. Never use people toothpaste as it can make them sick. Feline toothpaste tastes good to them. Dab a tiny amount on their lips so they can taste it. Lift up their lip and start with a swipe or two across the front teeth only. Continue daily until your cat allows you to cover the majority of his teeth. If you are unable to accomplish this, there are other options that, though not as good as brushing, will help to keep your cat’s teeth and gums clean. Dental gels and dental sprays work well. Simply spray into your cat’s mouth or dab on their front teeth and let the enzymes do the rest. Dental treats and chews can help reduce the risk of tartar buildup. They also make food specifically formulated to keep your pet’s teeth clean. Water additives are a last resort, as we generally find that our finicky little felines will not touch the water with any kind of additive in it. Annual veterinary checkups are recommended, as are professional dental cleanings. Error: Error validating access token: Session has expired on Monday, 29-Oct-18 09:08:51 PDT. The current time is Thursday, 18-Apr-19 19:15:53 PDT.